PlayStation Plus July 2014 Free Games: Leak Shows Games Coming to PS Plus in July 2014? The free games for PlayStation Plus next month may have been leaked. New games come to PS Plus every month and a leak usually happens a week or two before the start of the month. This leak was a listing from Sony Asia that the company later pulled but has been preserved on forums such as neoGAF. The leak is for Asia but the PlayStation 4 games have been identical in all regions, although the PS3 and PS Vita games are usually not. TowerFall Ascension (English version) and STRIDER (English/Japanese version) are the PS4 games listed by Sony Asia. 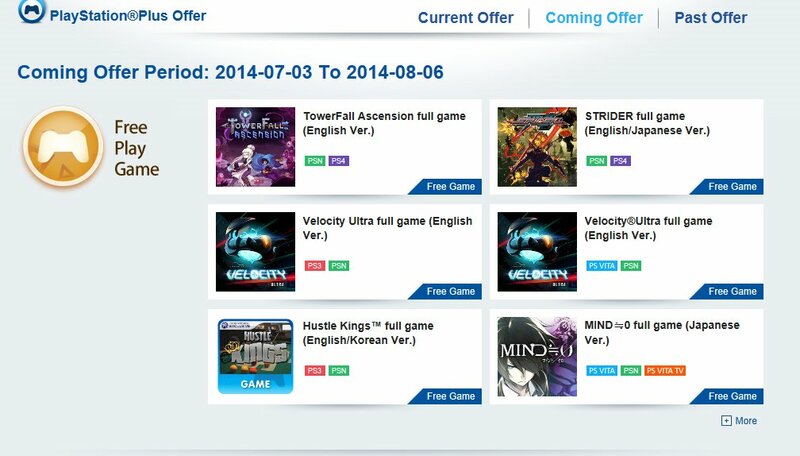 The other games are Velocity Ultra for PS 3, PS Vita, and PS Network; Hustle Kings (English/Korean version) for PS3 and PSN; and Mind=0 (Japanese version) for PS Vita, PS Network, and PS Vita TV. The blog also said that it’s unlikely that the other games will be offered in Europe or the United States. LOS ANGELES (AP) — The 2014 Electronic Entertainment Expo wasn’t as dramatic as last year’s, when Sony and Microsoft were battling for attention in advance of the fall debuts of their new game consoles, thePlayStation 4 and Xbox One. This year, the focus was on new games to play on those machines, so those of us who attended E3 at the Los Angeles Convention Center this week had a lot more fun. And the competition is far from over. Here are some winners and losers from the video-game industry’s biggest convention. — PLAYSTATION VS. XBOX: Consumers have bought a few million more PS4s than Xbox Ones, but that doesn’t mean Sony can rest on its laurels. Upcoming PS4 games include the steampunk thriller “The Order: 1886,” new installments of the popular “Uncharted” and “LittleBigPlanet” franchises, and a promising batch of games from smaller studios, like the psychedelic journey “Entwined” and the sci-fi exploration game “No Man’s Sky.” The Xbox One countered with the goofy “Sunset Overdrive,” the haunting “Ori and the Blind Forest” and new chapters of the “Halo,” ”Forza Horizon” and “Crackdown” series. WINNER: Xbox, by a very slim margin. — NINTENDO VS. THE SKEPTICS: The Wii U has had a rough time in the market, but Nintendo rewarded its diehard fans this year. There’s a new “Legend of Zelda” game (finally!) on the way. “Splatoon” brings Nintendo-style whimsy to the online shooter. “Captain Toad: Treasure Tracker” is a delightful puzzle game. And the Amiibo line, which connects real-world toys of Mario, Donkey Kong and the rest of Nintendo’s heroes to their digital counterparts, has collectors psyched. WINNER: Nintendo. — OCULUS VS. MORPHEUS: The most heavily hyped technology at E3 involved strapping on a headset and immersing your senses in 3-D virtual reality. Sony showed a few simple demos for its Project Morpheus device, letting you swing swords at a dummy or luge down a busy highway. The Oculus Rift inserts you right into Sega’s terrifying “Alien: Isolation,” a Mario-style platform game called “Lucky’s Tale” and the time-bending shooter “SuperHot.” I’m still skeptical about VR’s viability — neither headset is particularly comfortable — but Oculus is clearly further along. WINNER: Oculus. — MULTIPLAYER VS. SOLO: The buzziest demos at E3 were 2K Games’ four-versus-one monster hunt “Evolve,” Ubisoft’s five-on-five SWAT team drama “Rainbow Six: Siege” and Nintendo’s four-on-four paintball competition “Splatoon.” There were a few solo acts like Sony’s “The Order” on the floor, but if you want to play the hottest games this year and next, you had better find some friends. WINNER: multiplayer. — MOVING VS. SITTING: Motion-detecting game devices that force you to get off the sofa were all the rage a few years ago, thanks to Nintendo’s Wii and Microsoft’s Kinect. But now that you can buy an Xbox One without Kinect, you can sit down. I saw just one new Kinect game — Harmonix’s “Dance Central Spotlight” — and nothing in the Wii U lineup will burn any calories. WINNER: sitting.